This fragrant slow-cooked stew is a speciality of the small port of Fiscardo on the Greek island of Cephalonia. 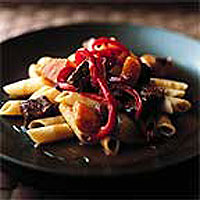 It is best served Italian-style with pasta tossed with mascarpone and some freshly grated nutmeg. Heat 2 tablespoons of oil in a large casserole and fry the shallots for 4-5 minutes, stirring until golden, then remove and reserve. Fry the red pepper in the oil left in the casserole for 3-4 minutes until lightly caramelised, then remove and set aside. Add the remaining oil to the casserole, increase the heat and fry the beef, turning to brown on all sides. Add the spices and fry for 30 seconds, then add the raisins, reserved shallots, stock and the salt. Bring to the boil, cover and reduce the heat, then simmer gently for 30 minutes. Add the butternut squash to the casserole and simmer for a further 30 minutes, uncovered, until the meat is perfectly tender and thoroughly cooked and the liquid is almost all absorbed. Add the wine vinegar to the pan, check the seasoning, and finish with the reserved red pepper strips. Serve with pasta tossed with a spoonful of mascarpone and a little freshly grated nutmeg. To peel shallots easily, place them in a large heatproof bowl and pour over enough boiling water to cover. Leave for 1 minute, then drain and peel - the skins will just slip off. Use 2 x 340g packs of diced lamb instead of beef - it's just as good. Replace the stock with 450ml of cold water and 150ml of dry white wine.